Aman Park is a bit of an oddball, it is a park that was donated to and is maintained by the city of Grand Rapids, even though it is well outside of the city’s borders. The Park is located on M 45, (Lake Michigan Drive) and is just over 2 miles west from the intersection of M 45 and M11 in Standale. There is a shared entrance with the Indian Trails Youth Camp, and their sign is easier to see than the sign for Aman Park itself. This park gets a lot of use, a whole lot of use. It is about halfway between Standale and Allendale, which is home to Grand Valley State University, so you have many of the students from GVSU who make use of the park. You may even have trouble finding a place to park during the busy times of day, all year round. It can seem crowded at times even in the park, especially in the summer, when I avoid it, but even on a nice winter’s day, it is crowded. So why do I still go there? For one thing, I caught my very first Steelhead out of Sand Creek many, many years ago, so there are lots of memories for me there. But the park is just so darned nice as well, which is why it gets so much use. The park lies along the banks of Sand Creek just a short way up from where the creek enters the Grand River. It is down in the Grand River Valley, so the winds there are usually lighter than most of the other parks I go to. There are several different loops in the trail system there so you can walk anywhere from 1 mile to 5 miles if you do all the loops. The trails are well laid out, and well-marked, and other than on a couple of the steeper hills, they are in very good shape for how much traffic they get. All that traffic keeps the trails open no matter how much snow we’ve gotten, but it can be bad when it has been thawing. The trails sometimes turn into sheets of ice and it can be hard to keep your footing, I bought my YaxTrax after a day like that in Aman Park. One other thing, the park normally floods in the spring, with Sand Creek overflowing its banks in places. You may not be able to walk all the trails during the floods, particularly near the bridge over Sand Creek on the north end of the park. The upside is that the floods refill the wetlands, and the spring peepers sign their little hearts out in the spring. There is a lot of wildlife in the park, I have seen deer, turkeys, squirrels, etc. there, and last year a pair of foxes had a den in the north end of the park. I saw them fairly often, and even saw the kits a couple of times, not what you would expect in a park that gets so much use. But the best reason to go there is the wildflowers in the spring. I can’t give you an exact date to go, since it varies from year to year, but the number of wildflowers that bloom there have to be seen to be appreciated. 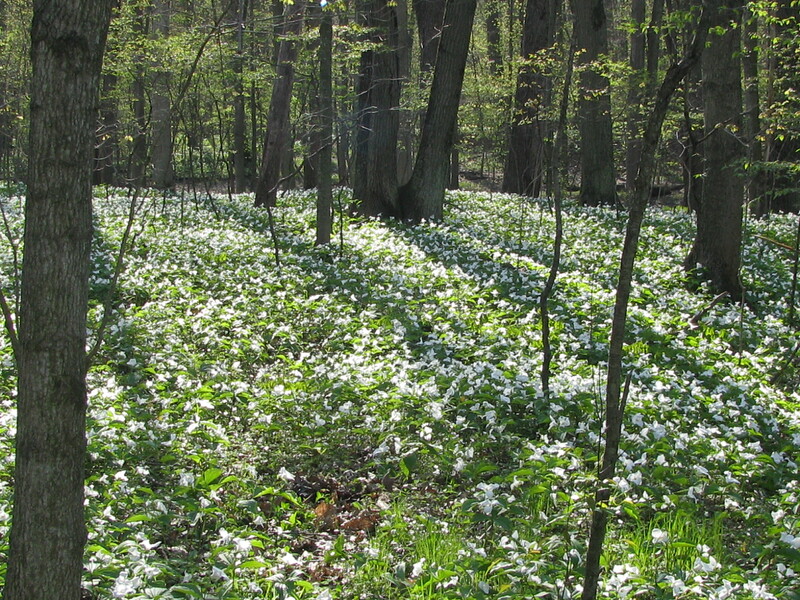 There are fields of trilliums and bluebells, as if they were planted there. I make it a point to go there every weekend from the middle of April until I catch the flowers in full bloom. So if you’re looking for a place to walk that’s close to Grand Rapids, this is a place to check out. Especially on cold, windy, winter days, being in the shelter of the Grand River Valley helps to keep you warmer than more exposed parks, and in the spring, the flowers are incredible!